Nurturing your prospects towards a buying decision requires you to deliver the right content at the right time. 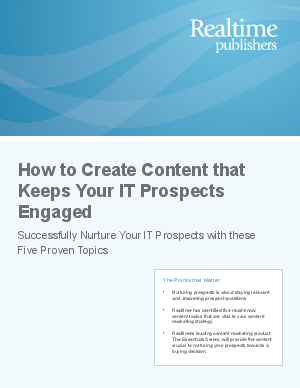 In this new article from Realtime Publishers entitled How to Create Content that Keeps Your IT Prospects Engaged, we examine IT prospects' most frequently asked questions and categorize them into five topical areas. You will learn how each of these questions reveals clues as to where a prospect stands in the buying cycle. Understanding these five topical areas will enable you to create content that successfully engages your prospects and advances them towards a buying decision.